Yesterday, EMC announced the addition of a new node type to their Isilon scale-out storage line. This new node offers higher-density storage than any other Isilon nodes, specifically 354TB raw capacity in 4U of rack space. The new node, known internally at EMC as “Colossus”, has been launched as the HD400. I’ll walk through the details below. EMC defines the HD-series nodes as a new tier of storage in an Isilon cluster. The creation of this new tier below “Nearline” leads me to believe that the HD400 will be sold based on its capacity and storage density, and not on its performance specs. The HD400 has 60 drives in a 4U form factor. 59 of these drives are 6TB nearline SATA drives used for data storage. The 60th drive is an 800GB SSD used for metadata acceleration (for NFS, the majority of the transactions to storage are for metadata information rather than actual reads or writes). This allows the HD400 to offer 354TB of raw capacity per node. If you created a maximum-size Isilon cluster (144 nodes) using nothing but HD400 nodes, you could have 50PB of raw capacity for a single filesystem. Like the S210 and X410 nodes EMC announced in 2014, the HD400 require 240V power. Also like the S210 and X410 nodes, the HD400 uses Quad-Data Rate (QDR) Infiniband ports for the back-end network. 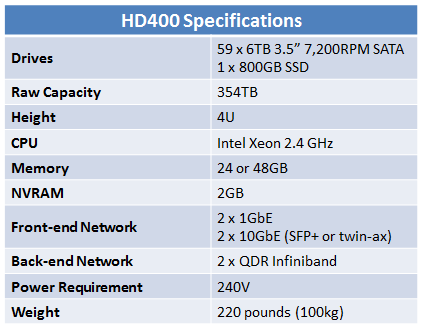 The full HD400 specifications are shown in the table below. I’ve already written about the requirement for 240V power above. With a depth of 35 inches (88.9cm), the HD400 is longer than other Isilon nodes, so customers will need to ensure that it will fit their racks. Also noteworthy — each HD400 node weighs in at 220 pounds (100kg). Fill a standard 40U or 42U data center rack with them, and those 10 nodes will weight 2,200 pounds (1,000kg). Make sure your floor tiles can handle the weight in advance of installing. Lastly, the HD400 nodes only run OneFS 7.2 or later. This means that customers wishing to add HD400 nodes to an existing cluster will need to upgrade the cluster to OneFS 7.2 before adding the new nodes. The HD400 nodes are available for ordering now. This entry was posted in Isilon and tagged Announcement, EMC, HD400, Isilon, OneFS, Storage. Bookmark the permalink.